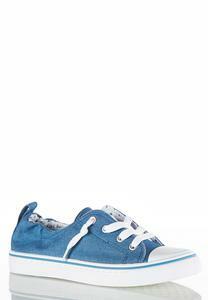 Cap your look off with a pair of classic sneakers - the rich blue denim fabric and toe cap design create a look that's part street and all chic. The shoe is super cute, but it runs 1/2 size too small. I even tried to use a shoe stretcher, but it didnt work.